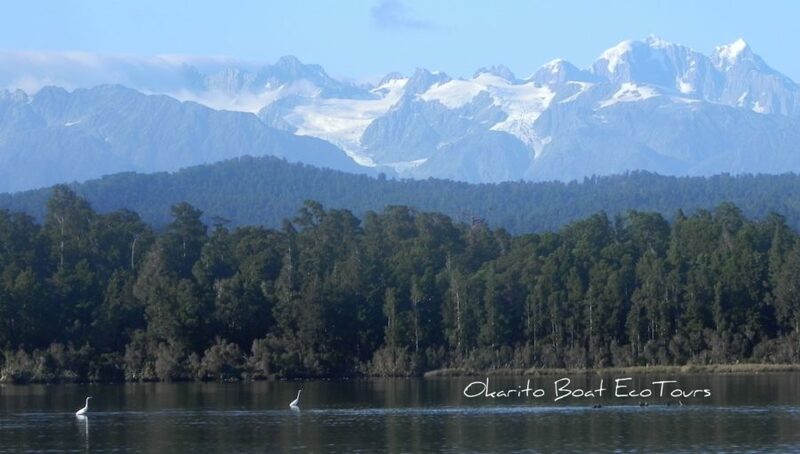 Okarito Boat Eco Tours Accommodation, include a morning tour and stay overnight with special discount, guests will receive a $10.00 off per person! Perfect overnight package to learn about New Zealand’s largest natural wetland. View the birds in their natural habitat and explore the rainforest waterways. Okarito Boat Tours & Accommodation offer you a choice of comfortable, private homes to relax and unwind in. Enjoy the luxury of your own cottage with kitchen, bathroom and from 1-3 bedrooms to suit couples,families or even small groups. Each house is unique and has its own special characteristics from spacious lawns and outdoor seating, to large open fireplaces, to cozy lofts and nooks – even an outdoor bath amongst the trees or outdoor fire where you can enjoy the stars of the Southern Sky. If falling asleep to the sound of the waves on the beach and owls in the trees and waking to the sound of bellbirds is the kind of holiday you are seeking, Okarito is for you. Pukeko Landing – The upper floor of an elevated house facing the Tasman Sea. It has a large deck, two sets of patio doors leading outside. Open plan lounge/dining area – full kitchen with gas hob/electric oven, dishwasher, full fridge/freezer and microwave. Large wood turner and firewood supplied for cool evenings. Two queen bedrooms with linens included plus 1 bathroom. Kiwi Cottage – A older style, small but cosy little cottage in the centre of Okarito, only footsteps to walking tracks and the beach. The little porch is perfect for catching the morning sun coming over the village. Two small bedrooms, 1 double and 1 twin.